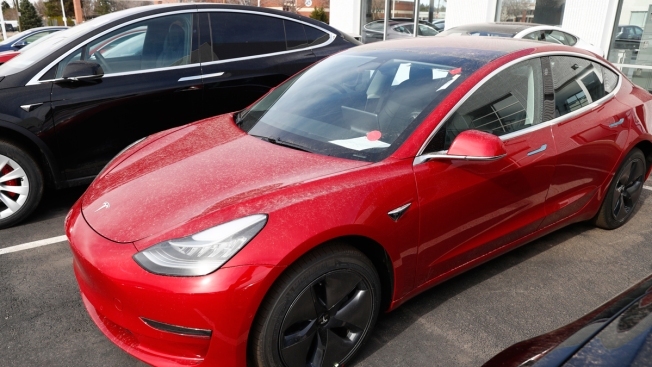 In this Sunday, April 15, 2018, photograph, an unsold 2018 Model 3 Long Range sits on a Tesla dealer's lot in the south Denver suburb of Littleton, Colo.
Consumer Reports says the car has exhilarating acceleration and handling. But testers were troubled by its 152-foot average stopping distance from 60 miles per hour in emergency braking tests. The distance was worse than any modern car Consumer Reports has tested and is about 7 feet longer than a Ford F-150 pickup truck. Tesla says its own tests found 60-to-zero braking distances averaging 133 feet. It also says it continually does software updates to improve factors such as stopping distance. The Model 3 is Tesla's first attempt to appeal to mass-market buyers. The car that starts at $35,000 has been plagued by production delays.